Pramod K. Srivastava, University of Connecticut School of Medicine, What does a host-protective tumor-specific neo-antigen look like? AAI President Linda A. Sherman will introduce the awardee and present the award prior to the start of the President's Address. AAI Executive Director M. Michele Hogan will introduce the awardee and present the award during the AAI Business Meeting & Awards Presentations session. AAI President Linda A. Sherman and BD Biosciences Vice President of Market Development Robert Balderas will introduce the awardee and present the award immediately prior to Dr. Kanneganti's lecture. AAI President Linda A. Sherman and Leonore A. Herzenberg, Professor (Research) of Genetics, Stanford School of Medicine, will introduce the awardee and present the award prior to the start of Saturday's Distinguished Lecture. The AAI-BioLegend Herzenberg Award recognizes outstanding research contributions to the field of immunology in the area of B cell biology. AAI President Linda A. Sherman will introduce the awardee and present the award immediately prior to Dr. Conley's lecture. AAI Committee on the Status of Women Chair Virginia Shapiro and Immediate Past FASEB President Margaret K. Offermann will introduce the awardee and present the award immediately prior to Dr. Griffin's lecture. The FASEB Excellence in Science Award is given in recognition of outstanding achievement by women in biological science. Recipients have furthered progress in a particular discipline through excellence in research. AAI President Linda A. Sherman, Susan M. Kaech, Yale University, and E. John Wherry, University of Pennsylvania, will introduce the awardee and present the award prior to the start of the President's Symposium. AAI President Linda A. Sherman and Thermo Fisher Scientific Senior Market Development Manager Jeff Croissant will introduce the awardee and present the award immediately prior to Dr. Germain's lecture. In addition to Career Awards, AAI annually provides more than 700 AAI meeting Travel Awards and Grants to recognize the promise and bolster the professional development of investigators of all career stages, including underrepresented minority scientists and trainees. For information on all AAI Awards, visit www.aai.org/Awards. Advances in translational immunology research have led to new approaches to awaken the immune system in the battle against infection, cancer, and autoimmune disease. This session will include discussion of present approaches and future directions that will be valuable to immunologists interested in translational research. NIH has long been one of the major sources of funding for immunologists and other biomedical researchers. In recent years, funding constraints have lowered NIH paylines and reduced success rates, jeopardizing the research and careers of many productive and successful scientists. This session will explore some of the alternatives to NIH funding, including patient advocacy organizations, philanthropists, and crowdfunding. In addition, the session will include an update on immunology research supported by the National Institute of Allergy and Infectious Diseases. Attendees will have ample opportunity to ask questions. Andy I. Kokaji, Senior Scientist, STEMCELL Technologies, Inc.
Robert L. Fairchild, Cleveland Clinic, My most excellent paper was returned with serious reviewer issues: what do I do now? In this session sponsored by the AAI Publications Committee, experienced editors will provide valuable insights in understanding the process of preparing a manuscript and responding to reviewers comments. Panelists will address questions such as: When writing a manuscript, what steps can an author take to enhance its impact on editors, reviewers, and, if accepted for publication, on readers? What are recommended practices for responding to reviewers’ comments? How can authors enhance the presentation of data in figures? In addition, the Editor-in-Chief of The Journal of Immunology will speak on how to avoid possible ethical missteps in scientific publishing. This symposium will feature topics on both human and veterinary vaccines, with emphasis on new technologies and new information for more appropriate targeting of the immune response to achieve protective immunity. Advances in understanding immune responses to veterinary and human pathogens and applications of that information to vaccine design illustrate a commonality that supports the current “one health” concept in medicine. Jeffrey D. Lifson, Leidos Biomedical Research, Inc. The objective of this panel discussion is to probe the relationship between inflammation and susceptibility to HIV infection and to identify novel avenues for HIV prevention, targeting mucosal microenvironment inflammation to limit HIV target cell availability. The panel will highlight recent findings and research gaps to address the key questions and challenges. Through workshops, roundtables, and one-on-one counseling, IMMUNOLOGY 2015™ provides critical career development programs. AAI is also offering an online and onsite Jobs Board free to meeting registrants and exhibitors. This workshop will provide participants with an overview of NIH grant application, review, and management. Emphasis will be given to identification of the most appropriate funding agency, how to make an application "reviewer friendly", and other strategies that contribute to applications that succeed in obtaining research funding. The workshop will also provide information on how to understand the peer review system, which is essential to competing successfully for funding, with a focus on recent changes to the review process. NIH review, grants management, and program staff will provide a broad array of expertise and encourage questions from seminar participants. This workshop is open to anyone but is especially intended for new faculty members, young investigators, and advanced postdoctoral fellows. For anyone seeking a job outside of academe, how you present yourself on paper is critical. A well prepared resumé can make all the difference in securing that interview. The focus of this session will be on the important elements of a resumé, the differences between a resumé and the standard academic curriculum vitae, and the information needed to make a good impression. In this special career development session, attendees will be instructed in how to transform their CVs into professional resumés. Small breakout sessions for individual consulting will follow from 10:30 AM to 12:30 PM in Room 211. Bring your CV! AAI reports on the “state of the association” to its members at every AAI annual meeting. Members will hear from the Executive Director, the Secretary-Treasurer, the Editor in Chief of The Journal of Immunology (The JI), and the Chair of the Committee on Public Affairs on the financial standing of AAI, the status of The JI, important public policy issues, and other items of interest for the membership. Special 2015 AAI awards will also be presented during this session. All abstracts – including those selected for Block Symposia – will be scheduled for poster presentation in Poster Sessions. This is perhaps the most dynamic aspect of the AAI annual meetings. Take part in face-to-face discussions with abstract authors and learn about their most recent, unpublished research. Poster Sessions will be held daily (unopposed by any other session) in the Exhibit Hall from 2:30 PM – 3:45 PM. Almost 2,000 authors will be present at IMMUNOLOGY 2015™ to discuss their most recent work, network with colleagues, and find the latest developments in their field. As you exit the President's Address, you'll be greeted by a traditional southern Louisiana band in the Great Hall Lobby for the Opening Night Welcome Reception. 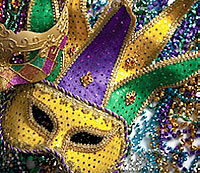 There you'll sample the many flavors of New Orleans cuisine, catch up with old friends, and be entertained by revelers "borrowed" from Mardi Gras—as well as psychic readers and jesters. Try the Cajun two-step to the celebrated Dwayne Dopsie & Zydeco Hellraisers band. Pause during your week of intense science to enjoy an evening with friends and colleagues at the AAI Gala: Lagniappe on the Levee—The Tastes and Tunes of New Orleans. At this festive event to be held at the historic Sugar Mill directly across from the Convention Center, you'll enjoy sampling the ambience and cuisines of three distinctive New Orleans neighborhoods—the Vieux Carré, the Garden District, and Cajun Bayou Country. You'll also be treated to the tunes of the 14-piece Swingaroux Band performing the many different genres of Louisiana music. And when you aren't dancing, you'll find lagniappe in novelty entertainment. 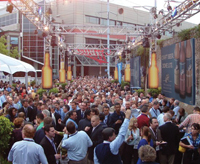 *Lagniappe: a Creole expression pronounced [lay-nee-ap] and meaning "a little something extra"
Coming soon: final List of Exhibitors at IMMUNOLOGY 2015™. Click here to view the Schedule of Exhibitor Workshops – Be sure to take advantage of the knowledge-building opportunities presented in Exhibitor Workshops. Located on the Exhibit Floor, these workshops explore companies’ latest technologies, products, and services through demonstrations and discussions. Exhibit Hall Passport Program - Fill out your Exhibit Hall Passport for a chance to win one of three $250 American Express gift cards. Entries must be received by Monday, May 11, at 2:00 PM. The drawing will be held during the Poster Presentations on Monday, May 11 from 2:30 PM – 3:45 PM. You'll find your Passport in your meeting bag or you may pick one up at the AAI Booth.